Studio located in an old building, completely recycled. Second floor by elevator. Ceiling with double height. Slash pine floors, original wood openings. Stylish details. On the ground floor, living room, desk, fully equipped kitchen and bathroom with Jacuzzi. Upstairs, bedroom with a balcony. Shared terrace and solarium. If you want authentic atmosphere rather than an antiseptic hotel, then this is what we offer. Very nice and clean appartment where we spend three weeks for the third time. 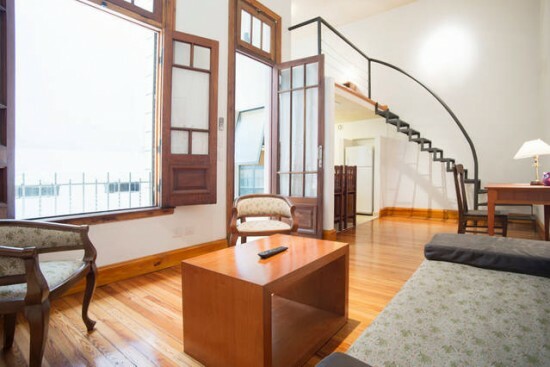 San Telmo is a wonderfull neighbourhood to stay. Very nice owners. Excelente la ubicación, atención y el depto. es muy lindo! Muy lindo y comodo lugar, excelente ubicacion. Como siempre la agencia un exito! Es hat mir sehr gut gefallen in dieser Wohnung! Die Vermieter waren sehr freundlich und zuvorkommend! Leider gingen nur die Fenster direkt in den Lichthof, wo auch die (sehr notwendigen, weil heiß) Klimaanlagen montiert waren. Deshalb war es nicht ratsam, das Fenster wegen des Lärms zu öffnen. Auch den Lift vermied ich, so gut es ging, denn ich hatte darin immer ein mulmiges Gefühl. Aber alles in allem war es ein super toller Aufenthalt in Buenos Aires! Ich würde wieder gern in dieser Wohnung wohnen und kann sie auch weiterempfehlen. The place looks exactly like the pictures. It was very clean, the location is really perfect, nice bars and restaurants in 4 min walking distance, there is also a supermarket nearby and the center is in walking distance as well. The check-in and check-out were really uncomplicated and friendly. If you are a couple or two friends visiting buenos aires for a few days or weeks I really think it\'s the perfect place to stay! A very comfortable apartment in a great neighbourhood. Stylish & modern look with space for working/studying and dining with guests. Apartment owner & Casa San Telmo ataff were really helpful & friendly. The apartment is very nice, spacious, modern, clean and is in a safe area that is very close to public transport, restaurants and kioskos. The building has an elevator and the terrace upstairs is amazing. I had a few issues with the wifi but the owner was very helpful and speaks English. I highly recommend this apartment. I miss it already. The apartment is well appointed close to amenities and has everything you need for a very comfortable stay. Very quiet and private also. The landlord is extremely helpful and thoughtful - we had a power outage one night and I came home to find a flashlight tied onto my door! Nothing was too much trouble. Limpio, bien ubicado y equipado con todo lo necesario para una estadía de más de una semana. Buen servicio, falta teléfono. Recomendable. Das Appartement ist wirklich zu empfehlen, ganz neu renoviert, sehr komfortabel und gut eingerichtet. Wir haben uns gern dort aufgehalten und uns uns sicher gefühlt. Super Ausgangsmöglichkeit, um die Stadt zu besichtigen. Die Vermieter sind sehr nett. Very nice apartment : brand new, equipped well, quiet . Public transportation at a split distance. We had great moments in Buenos Aires.